Mozenas' HQ ::: Campaign Store - "Free Stuff"
They're here and they're FREE: Instant Mozena Campaign Posters, Bumper Stickers and Button Stickers. You no longer need someone else to get a campaign poster, bumper sticker or sticker button made up for you, you can do it yourself, instantly. All you need is your own computer and color printer. The Mozenas lead, others follow. Now watch all politicians and would-be politicians start to use these instant marketing materials for their campaigns. It's just another progressive idea brought to you by Steve Mozena. The City of Carson needs this kind of creative thinking applied to City business. 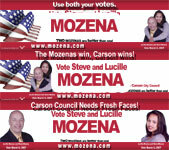 Support Steve and Lucille in the upcoming Carson election--print out your Instant Mozena Campaign Posters, Bumper Stickers and Button Stickers now for FREE and display them wherever there is space! "Two Mozenas are better than one!" Print an Instant Mozena Campaign Poster, Bumper Sticker and/or Button Sticker for FREE, Using Your Own Computer and Color Printer! Click here for an "Instant Campaign Poster." Load your computer printer drawer with Avery full-sheet 8 1/2 x 11 inches label paper, cardstock or regular paper from Staples, Office Depot or your local retailer with stationery supplies. 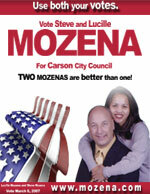 Then, using your color printer, print out the Instant "Mozenas for Carson Council" Campaign poster. Post them on your car windows, home windows, office bulletin boards, store windows, lockers, company bulletin boards, and anywhere else where they will be seen by the public, to help the Mozenas' win for Carson. Click here to print three (3) bumper stickers. Go to Staples, Office Depot or your local stationery store and purchase Avery full sheet labels, 8 1/2 x 11 inches. Insert the labels in the printer drawer, click on print. Cut along dotted line. Then, stick them to some car bumpers -- your own car bumper and those of your relatives, your neighbors, your friends and co-workers, with their permission of course!, or post the bumper stickers anywhere else you think they will be noticed. Or give them out to anyone and everyone who would like to help the Mozenas win for Carson. Click here to print nine (9) round button stickers. Go to Staples, Office Depot or your local stationery store and purchase Avery full sheet labels, 8 1/2 x 11 inches. Insert the labels in the printer drawer, click on print. Cut around circle of button. Wear the button on your shirt, bring the extras with you and pass them out to your neighbors, friends, co-workers, fellow church members, and all fellow Carsonites, to help the Mozenas win, for you and Carson. Place the button stickers wherever you think they will attract attention and help the Mozenas win.